This is one restaurant that recently opened in Resort World Sentosa and is little known in Singapore outside of the foodies circle, primarily due to its segregated location. 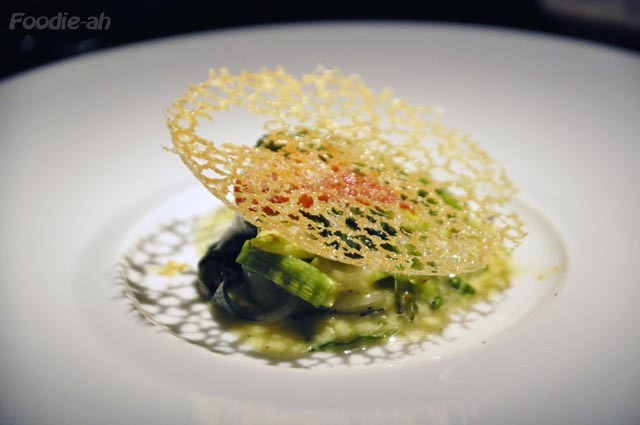 Odd enough, the Singapore branch of this renowned fine dining chain of restaurants, is not even mentioned on the official website (as of the date of publishing of this post). Without a doubt, as you walk through the door you are overwhelmed by the sophistication of the ambiance. 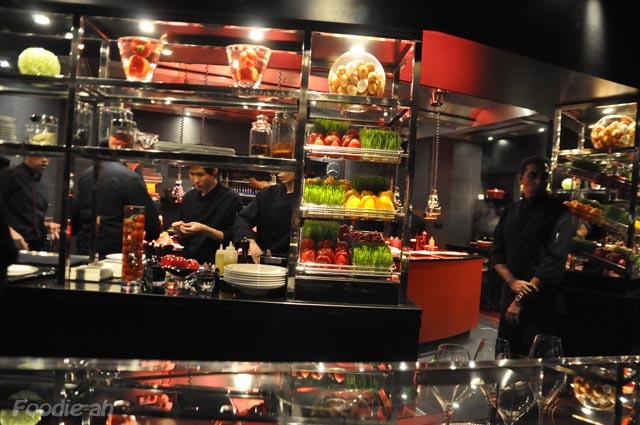 An unique combination of black and strong red dominates the restaurant throughout. The lighting is extremely dim, but well thought spotlights point in all the right places (most importantly, right on your on plate!) to create a very suggestive ambiance. The vivid colors displayed in front of the kitchen are the result of a display of stacks of fresh produce such as carrots, apples or tomatoes. Behind, the busy and dynamic kitchen is fully in view for the diners, who sit around a semi-circular counter. 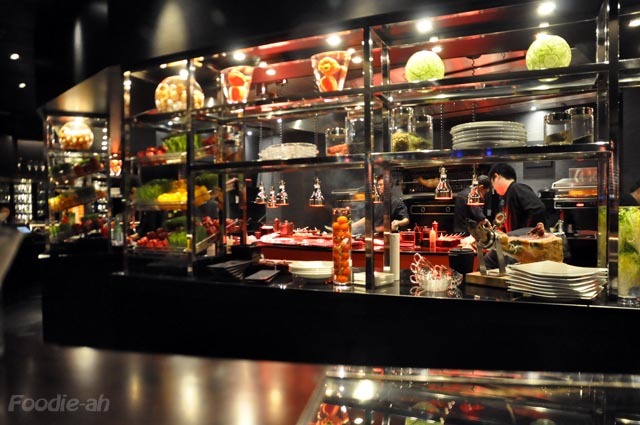 The open kitchen-bar concept is fundamental to the attractiveness and the success of this restaurant. Watching the Chefs at work is entertaining for the diners impatient to know what's going to be next on their plate. 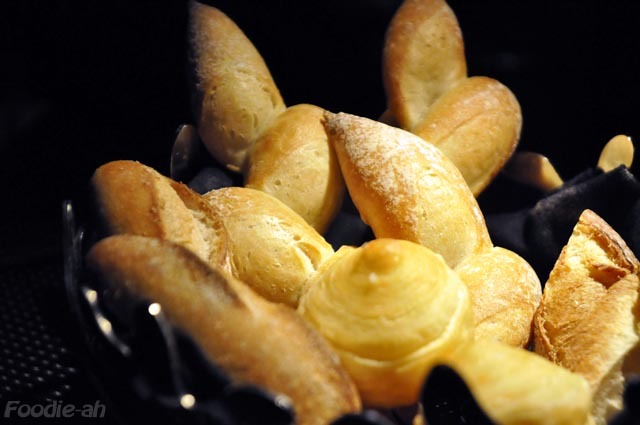 As we sat down, we were served a beautiful basket of assorted fresh bread and while munching on it, we took our time to decide what to order from the menu. 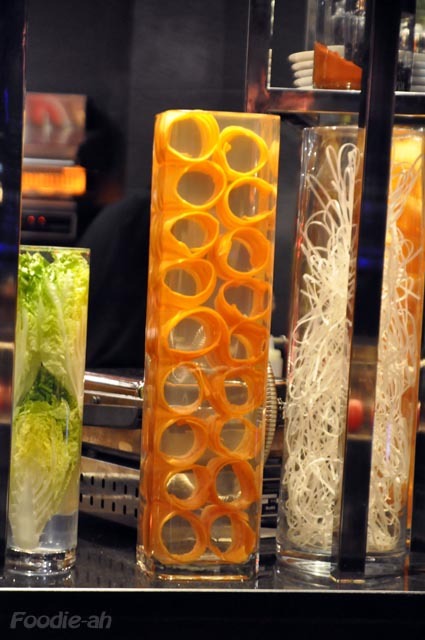 They offer a selection of about 20 "small dishes", 8 appetizers and 7 mains. The waiter recommended about 4 small dishes each, but we had about 3 to share and a main each and that was definitely filling enough for us. 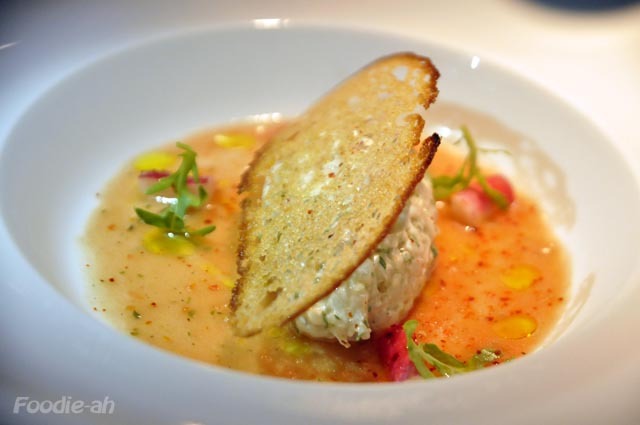 They started off with an amuse bouche of foie gras mousse and Parmesan. Decadent, sophisticated, delicious. I was really impressed by the Grilled seasonal vegetable with a touch of wasabi (S$29). I would have never thought a vegetarian dish could be so addictive, to the point that I would order it again on my next visit. Even more impressive, I shall say unforgettable, this Yellowtail tuna tartar with spicy tomato sauce(S$29). I am looking forward to visit L'Atelier again to get to taste once more their Milk fed pig, roasted on the spit with braised green cabbage and fresh ginger (S$45). This is their signature dish, and it's amazing how this succulent, juicy pork is perfectly complemented by the flavour of ginger. 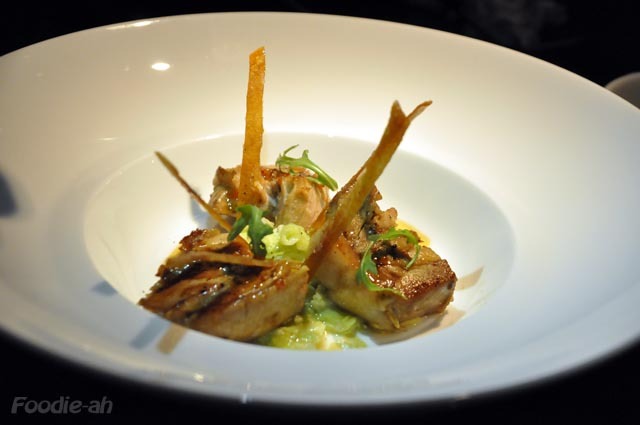 The Foie gras filled free-range quail with mashed potatoes (S$53) was also well executed. 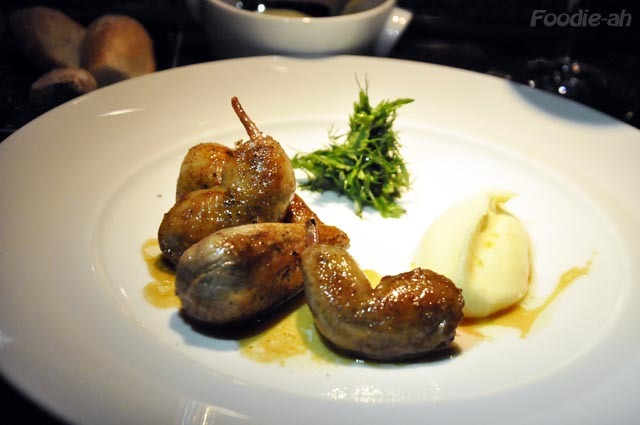 A quail stuffed with foie gras, accompanies by very butter rich mashed potatoes. I enjoyed the dish, although after trying the pork, this was eclipsed by it. I didn't get too excited by the Lamb fillet served with spiced eggplant (S$45). The seasoning reminded me of Mexican food (there was a dominant cumin flavour), and the dish just wasn't as exciting as everything else we had. 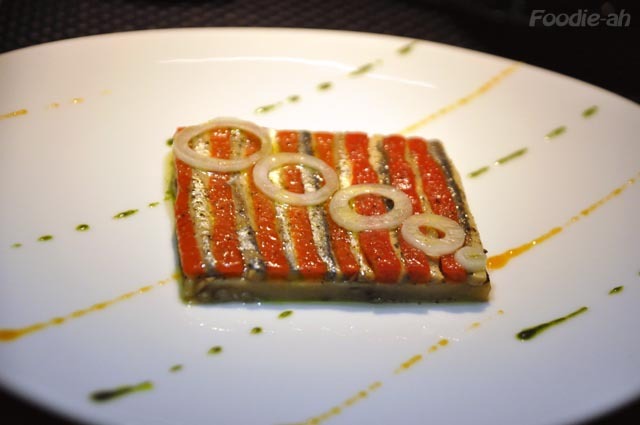 I have much better things to say about the Marinated anchovies with eggplant confit (S$27). Beautifully presented, the highlight of this dish was that the fresh sardines (don't think of the tinned stuff!) 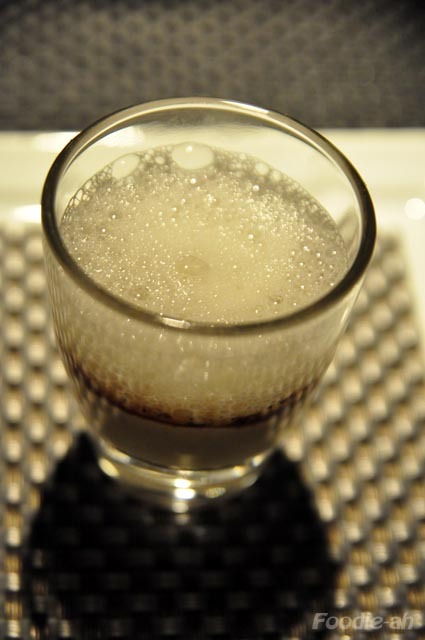 revealed that "sea" flavour which is characteristic of anchovies, sardines and mackerel. This is not a flavour that is commonly found in Singapore, since it's typical of fish from the Mediterranean. The dessert we chose was chocolate based: Caribbean, hazelnut dacquoise, thin Orizaba chocolate leaves (S$23). An enjoyable, indulgent composition of ice cream, chocolate thins, and a rich chocolate ganache. 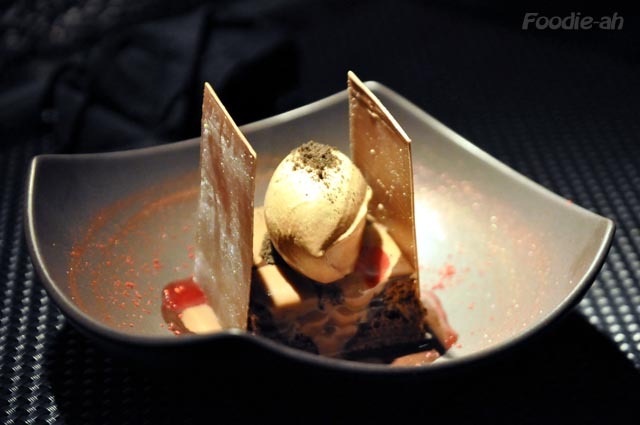 In conclusion, l'Atelier de Robuchon was a fantastic experience, which perhaps doesn't come cheap, but when compared to other similar restaurants marketed at a similar level, is worth every penny. What a marvellous and beautiful meal! :) Every dish looks so beautiful. I loved their amuse bouche too. The rest I have not tried, but I hope to go back again! I agree, I do think this is a wonderful restaurant and the good news is that it looks like they are doing pretty well. I saw you went to the opening back in April! 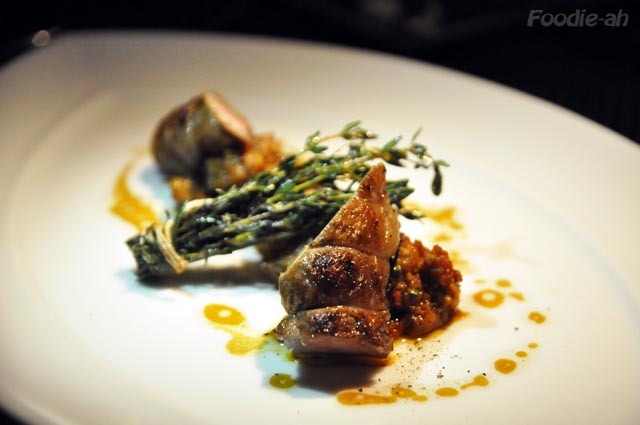 The quail still looks the same as in your post, however next time I think I will be tempted to have the pork once more.